Honolulu based newspaper MidWeek is reporting that "Jurassic World" — the fourth film in the "Jurassic Park" series — is set to film on both Oahu and Kauai later this year. "Pre-production is under way for 'Jurassic Park 4', scheduled to begin filming on Oahu for four weeks in April, followed by two weeks on Kauai," the report states. Rumors have been circulating that a production office was set up in Oahu, so this new report makes sense. 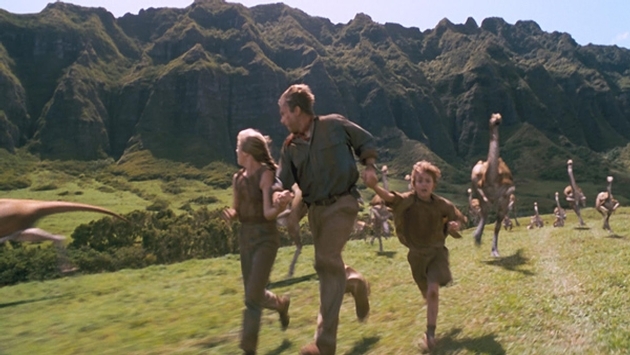 Furthermore, "Jurassic Park" filmed on both Oahu and Kauai back in 1992. The help you remember these locales, it may help to mention the famous Gallimimus scene was filmed on Oahu. After six weeks in Hawaii, the production team will reportedly move to Louisiana for the sound stage and interior work. We're so excited to see "Jurassic World" when it's released in theaters. Are you?